Opens eight screen multiplex each in Bangalore and Mumbai. PVR is celebrating its 15 years of existence in the Indian market. Keeping in mind the same they have recently opened eight screen multiplex each in Mumbai and Bangalore. The new multiplexes offer an ultimate movie viewing with ECX (Enhanced Cinema Experience) technology. With this launch, PVR today stands at 213 screens in 46 cinemas in 13 states, 1 Union territory & 27 cities across India. 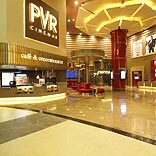 PVR (ECX) will introduce the next level of cinema experience - complete navigation programming, advanced technology and state- of- art , elaborate food and beverages formats by team of Chefs at Café ‘in non-ticketed area, specialized kiosks, candy and the first-ever gold-class auditorium . It will offer 4K Digital Projection System, 7.1 Dolby surround sound and 8 silver 3D screens. Sanjeev Bijli, JMD, PVR Ltd. said, “Bangalore has been our area of focus, considering a strong and huge market spread and acceptance for more than 5 different languages/content. The market is very fertile to witness an enhanced cinematic exposure with the launch of ECX cinema leading to a massive content spread. While the property at Mumbai is spread across 60,000 sqft and capacity of 1518 seats, the Bangalore multiplex is spread across an area of 1, 15,000 sqft and capacity of 2718 people.